Today’s featured photograph gives us a blossoming spring day in Japan, as the country’s iconic cherry trees explode into full bloom surrounding Hirosaki Castle, an Edo-period hilltop structure dating from 1611 AD. 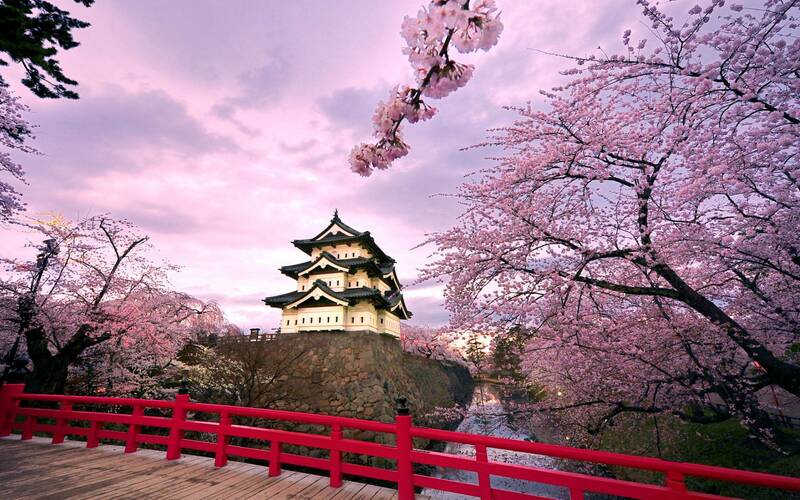 The delicate pink flowers are reflected in the cloudy sky, tinting the normally white castle walls to match their hue. All the elements surround and gravitate inwards by the use of a bowing ultra-wide angle, drawing the eye in a cyclical motion towards the magnificent building at the picture’s core. This image circulated through social media and imgur was reportedly created by Australian artist Glenn Waters, a Getty Images photographer who has lived in Japan for over 25 years. It was captured on a Nikon D700, likely with a Nikon 14-24mm lens. As evidenced by the large depth of field, it uses a very small aperture – possibly f/16 or f/22 – and a very low ISO to achieve the fine detail and rich, popping colours with which it captures the essence and beauty of its timeless piece of the world. This picture and many more like this are the reason I love Japan.